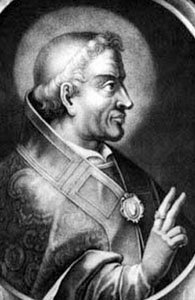 Pope Saint Agapetus 1 born in Rome, son of Gordianus, a Roman priest who had been slain during the riots in the days of Pope Symmachus. He collaborated with Cassiodorus in founding at Rome a library of ecclesiastical authors in Greek and Latin, and helped Cassiodorus with the project at Vivarium of translating the standard Greek philosophers into Latin. His first official act was to burn, in the presence of the assembled clergy, the anathema which Boniface II had pronounced against the latter's deceased rival Dioscurus, with a false charge of Simony, and ordered to be preserved in the Roman archives. [ He agreed the decrees of the council of Carthage, after the retaking of North Africa from the Vandals, which converts from Arianism were declared ineligible to Holy Orders and those already ordained were admitted to lay communion. He accepted an appeal from Contumeliosus, Bishop of Riez, whom a council at Marseilles had condemned for immorality, and ordered Caesarius of Arles to grant the accused a new trial before papal delegates. Meanwhile the Byzantine general Belisarius, after the conquest of Sicily, was preparing for an invasion of Italy. King Theodahad as a last resort, begged him to proceed on an embassy to Constantinople, and use his personal influence to appease Emperor Justinian I following the death of Amalasuntha. To defray the costs of the embassy, he compelled to pledge the sacred vessels of the Church of Rome. He set out in winter with five bishops and a big retinue. In February, 536, he appeared in the capital of the East and was received with all the honors befitting the head of the Catholic Church. Agapetus's attempt failed and Justinian could not be swerved from his resolve to re-establish the rights of the great Empire in Italy. But from the ecclesiastical view, the visit of the Pope in Constantinople resulted in a great triumph as memorable as the campaigns of Belisarius concerning the Monophysite. The occupant of the Byzantine patriarchal see was Anthimus I, who without the backing of the canons had left his episcopal see of Trebizond to join the crypto-Monophysites who with the Empress Theodora were then intriguing to undermine the authority of the Council of Chalcedon. Against the protests of the orthodox, the Empress finally seated Anthimus in the patriarchal chair. No sooner had the Pope arrived than the most prominent of the clergy brought charges against the new patriarch as an intruder and heretic. Agapetus ordered him to make a written profession of faith and to return to his forsaken see upon his refusal, he declined to have any relations with him. This annoyed the Emperor, who had been deceived by his wife as to the orthodoxy of her favorite, and the Emperor threatened the Pope with banishment. Agapetus is said to have replied "With eager longing have I come to gaze upon the Most Christian Emperor Justinian. In his place I find a Diocletian, whose threats, however, terrify me not." This language made Justinian pause and Justinian was convinced that Anthimus was unsound in faith. He made no objection to the Pope's exercising the plenitude of his powers in deposing and suspending Anthimus and, for the first time in the history of the Church, personally consecrating his legally elected successor, Mennas. This exercise of the papal prerogative was not forgotten by the Orientals, who, together with the Latins, venerate him as a saint. In order to clear himself of every suspicion of abetting heresy, Justinian gave to the Pope a written confession of faith, which the latter accepted with the proviso that "although he could not admit in a layman the right of teaching religion, he observed with pleasure that the zeal of the Emperor was in perfect accord with the decisions of the Fathers". Afterwards he got ill and died on April 22, 536, after a reign of ten months. His remains were brought in a lead coffin to Rome and deposited in St. Peter's Basilica.